When stargazing with your naked eyes, you can see more than 6,000 stars, 88 constellations, dozens of faint fuzzies, five planets, one Moon and more. A star map helps you become familiar with the constellations and the stars and faint fuzzies in them and means that you’re never at a loss for something to look for in the night sky. At first glance, a star map may look like a bewildering array of dots, shapes and lines. But if you remember a few simple things, you’ll find that everything starts to make sense. At night, use a dim red torch to view your maps so that you don’t spoil your night vision. If you use a red torch, you won’t be able to see colours at all, so a simple black-and-white star map is actually better for outdoor use than a coloured one. Stars on star maps are represented by dots or, more correctly, circles. Most star maps use different sizes of dot to show the brightness of stars. The largest dots are the very brightest stars, which are visible no matter how bad the light pollution is. The smallest dots are the faintest stars that you’ll be able to see from a rural sky without straining your eyes too much. Some star maps use a much broader range of dot sizes, to show very faint stars that are only visible in perfect conditions or with binoculars or a telescope. These maps are great if you want to explore the sky in lots of detail. You can join up the brightest stars in a constellation on a star map with lines showing the general outline, or maybe just the brightest asterism within and among the constellations, such as the Big Dipper or the Summer Triangle. Although the boundaries of all the constellations are very well defined, the way stars are joined within a constellation to make a pattern may vary slightly from map to map. Some stars are more interesting than others. For example, some stars are actually multiple stars, for which, through binoculars or a telescope, you can see more than one star making up the single dot visible to your naked eye. Some stars are variable stars that change in brightness over time, dimming and brightening. These stars are especially interesting to stargazers, so they usually get marked slightly differently on star maps. Multiple stars: Some multiples, such as Mizar and Alcor in the handle of the Big Dipper, are two stars that are far enough apart that you can mark them both on the star map without having to use the special symbol. In some cases, these stars may overlap, and one black dot is placed on top of, or overlapping with, another black dot. In this case, the smaller dot is usually given a white border so that you can see it better. In most cases, though, multiple stars are closer together than you can easily mark on a map, and so the star is given a slightly different label – a dot with a line through it. 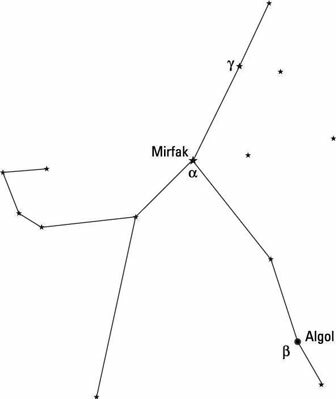 In the case of Mizar and Alcor, both of these stars are themselves double stars, and so they both have lines through them. Variable stars: Stars that change in brightness are sometimes marked with a dot inside a circle. The size of the circle represents the brightest the star gets to, while the size of the dot shows the faintest it gets to. Imagine these marks with the inner black dot growing and shrinking in size, sometimes filling the whole circle, sometimes fading to the size of the small inner dot. Declination tells you how far from the celestial equator a star is, and is measured in degrees, just like latitude on Earth tells you how far from the Earth’s equator you are, in degrees. When astronomers say that a star, such as Canopus, has a declination of –52°41’, it means that it’s that many degrees south (the minus sign applies to all stars in the southern hemisphere) of the celestial equator. RA is measured as the angular distance along the celestial equator from the First Point of Aries, a position on the celestial equator in the constellation of Pisces. Rather than measure this angle in degrees, RA is measured in hours, minutes and seconds, so that the whole circle around the Earth is 24 hours. Therefore, when someone says that Canopus has an RA of 06h24m, it means that its RA coordinate is just over one quarter of the way around the sky (6h is one-quarter of 24h) from the First Point of Aries. RA is always measured eastward from the First Point of Aries.